Teaching vocabulary, grammar and punctuation for better performance in the VGP key stage tests is important for league tables and inspections, but, for many children, it does little to improve spoken and written language. It’s possible, however, to teach VGP in such a way that it leads to high quality writing, while simultaneously preparing for good grammar test results. Notice how authors/ writers use the grammar you are focusing upon. It really is all about the reading, and noticing how experts do it is vital. It will not only help children see how to use a grammatical device for real purpose and impact, it will also show how not to over-use it. Notice that authors don’t over-use adjectives, or exclamation marks; notice that “said” is often the most useful verb for speaking and that more descriptive verbs are used sparingly; notice that most writers use the relative clause sparingly, but to great effect! Teach the grammar in fun, multi-sensory ways. 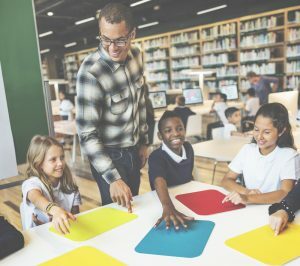 Our favourite is to write a relevant simple sentence on a strip of paper, held at the front of the class by a couple of children, and then to add to it using the focus skill on mini-whiteboards, using physical punctuation; notice what can be moved around the main clause, and to what effect on meaning. But there’s also dice and odd-one-out games, and so on; all more engaging and effective than written grammatical exercises. Model its use in shared writing. Don’t just show a pre-written model: actually model the process of writing, model the contextual application of the focus skill, and then invite children to join in, practising application of the skill in this safe environment. Use mini-plenaries to check on this application. Stop the writing frequently and have them self- and peer-check for use of the focus skill. Doing this in a final plenary is too late: too late to fix the situation, and too late to share examples in a truly useful way. Be clear what VGP you want to see in the children’s independent writing (writing that hasn’t just been modelled). If you’re concerned that this stops it being truly “independent”, then get the children to remind each other – or just remind themselves – without any prompting. But be clear that you will be looking for the recently taught VGP elements in their compositions. Never forget that the best and most frequent readers use much of the required grammar anyway, and find it relatively easy to learn new structures (and this can be true of very young children who have been frequently read to). The more that children enjoy reading, the more they will do it, and the less of a struggle the entire writing process will be! 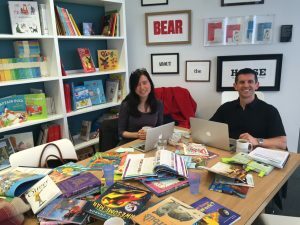 Primary Education Advisors Lindsay Pickton and Christine Chen are the Series Editors of Treasure House Teacher’s Guides. To find out more about Lindsay and Christine, click here. Treasure House is a flexible bank of digital and print literacy resources, written for the 2014 National Curriculum for English. Explore the Treasure House resources available here.